In Nanaksagar, a small village in Chhattisgarh’s Mahasamund district, all the 206 houses wear a pink hue. It all started with the Panchayat Head’s idea to paint houses that had toilet pink so that identifying those houses which needed one became easier. Today, that local campaign has taken on the form of a larger cleanliness and sanitation campaign, which has been adopted by several other villages in the district. Houses in the neighbouring village of Sapos are painted green, a colour that stands for unity and prosperity, according to the villagers. Most of these colourful houses also have a small garden in front, and a large dustbin placed outside to ensure that there is no littering in the vicinity. The roads in the village are concrete and clean, with a proper drainage system in place. A number of awareness messages on cleanliness and sanitation have been painted on the walls of a number of houses. One such message is about a fine of Rs 200 being levied on anyone caught urinating or defecating in the public and a reward of Rs 1,000 for those who report the offender. The village also has a neatly outlined map indicating the rows of green houses, the lanes, places of public worship, among others. What was once considered a hypothetical representation of a model Indian village is today a reality across 30 villages like Nanaksagar and Sapos in Chhattisgarh’s Mahasamund district. 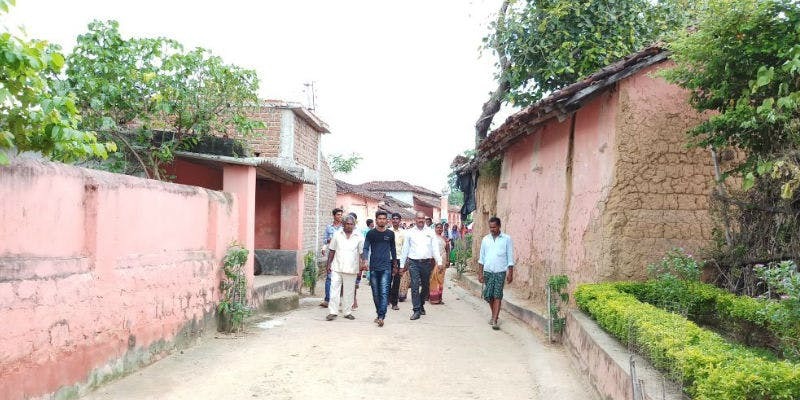 Six villages each in five blocks of the district have opted to be painted uniformly in a colour of their choice, a colour that has been accorded a narrative that celebrates sanitation and cleanliness by the community. In addition, to taking responsibility of keeping the villages defecation and litter free, the community and the local Panchayat collaborate to ensure that the village is equipped with basic infrastructure such as authorised water and electricity connections. A few villages have even gone a step ahead and implemented impactful measures such as curbing the use of polythene, going alcohol free, installing street lights, organising regular plantation drives, among others. In fact, residents of Sapos have also put in place a well-defined system to protect the local forest. Based on a pre-defined roster, two village residents are designated to go to the forest every day and ensure that no trees are cut and the forest is well-protected. The magic wand which helped transform these villages become open-defecation and litter-free and then fuel a chain of positive changes is community ownership. The District Administration’s role was limited to conducting awareness campaigns and encouraging those who embraced change. The campaign’s impact is such that today these 30 villages are a far cry from what they once were, and are enjoying a lot of positivity and prosperity. These villages come as a breath of fresh air at a time when the discussion around the negative impact of open defecation and littering is gaining ground in India. Other than posing health hazards (diarrhoea, enteropathy, and other chronic sicknesses that leads to malnutrition), open defecation is also detrimental to the environment as much as littering. Open defection and littering, both social malpractices, introduce toxins and bacteria into the ecosystem in large amounts which cannot be broken down or decompose naturally, these eventually end up in the water systems, which harms life both on water and land and eventually get into the food chain. Also, the sight and smell of human excreta or piles of litter is unappealing and undignified, especially for people who have to live close to such dirty areas. The waste attracts large swarms of pests, which also increases the threat of outbreak of communicable diseases. Considered a universal and age-old problem in India, the solution for open defecation and littering cannot be limited to strong awareness campaigns or government support or regulations. There have been instances where people are unwilling to give up the habit of open defecation even after constructing a toilet in their homes or having access to community toilets in the vicinity. People still litter the streets even when a public dustbin is a few yards away. Here, the people of Mahasamund district have shown the way in how community ownership can drive transformational change with far-reaching impact.